It seems that the coming year will bring much surprises to the fans of tablets and smartphones. The Korean manufacturer Samsung has released an advertising video which present the new flexible and transparent smartphone. Along with a number of advanced features in it, you may now wrap or fold your favorite Samsung device as a piece of paper. Video illustrates how big is the surprise of the people surrounding the owner of such a device. 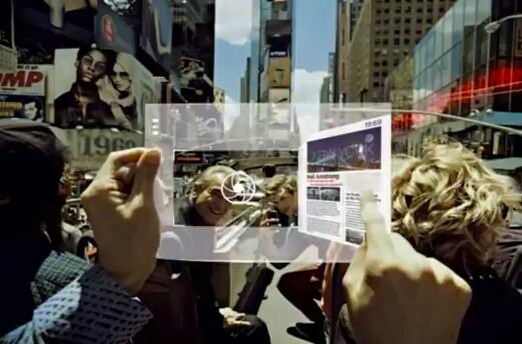 The ultrathin OLED display of the Samsung transparent device can be wrapped and folded in any way without harming it. Being a smartphone, the flexible device still allows for making pictures and videos, surfing the internet, sharing files, using the tablet as an ebook reader and speech to text translator. According to the manufacturer, the Samsung device will be equipped with a technology of displaying the 3D video as well, a microphone and a camera. The display will be made on the AMOLED technology and can be used from both its sides to view the picture on the screen. Let us hope that such an innovative Samsung device will appear someday soon and with a reasonable price so we could test and use it. Something similar was already released earlier this year by Nokia – the flexible device was called Kinectic. Next Next post: Why Does the Moon Looks Red During Eclipse?